(Nanowerk News) Just a few decades ago, scientists believed that all ordered matter consists of self–repeating building blocks—atoms, ions or molecules. In this view, the ordinary solids of everyday life are arranged in crystals of repeating, three–dimensional patterns. Scientists challenged this once–believed universal law of nature when they discovered an “impossible” material whose existence could not be explained by periodic arrangement of atoms. These materials, later named quasicrystals, follow different, mathematically strict yet non–repeating patterns. Since then, quasicrystals have been discovered in approximately 100 synthetic intermetallic compounds and, in 2009, in a geological specimen. But questions remained. How and why do they form, are they stable, and what is their precise atomic structure? 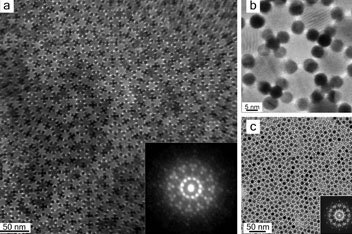 Now the University of Chicago’s Dmitri Talapin and his colleagues have created quasicrystals out of self–assembling nanoparticles for the first time. Self–assembly techniques harness nature’s own tendencies to develop novel materials. The techniques also promise to reveal new details of quasicrystals’ atomic structure in a way that elude even the most powerful microscopy techniques. “Here we have nature working for us and creating all this amazing complexity,” said Talapin, assistant professor in chemistry at the University of Chicago. He and colleagues at Argonne National Laboratory and the University of Pennsylvania report their findings in a recent issue of the journal Nature ("Quasicrystalline order in self-assembled binary nanoparticle superlattices"). Because quasicrystals are rare, scientists have not yet fully explored their properties. However, existing experimental and theoretical studies point to the possibilities of achieving unprecedented mechanical, optical and electronic properties. This exploration would greatly benefit from a better understanding of fundamental rules governing the formation of quasicrystals, said Talapin. Their study continues to give scientists a new appreciation for the complexity and beauty of solids, which form the basis of modern life and technology.